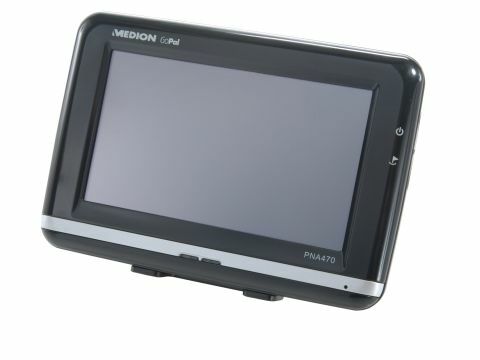 Medion's GoPal PNA470 is the firm's new top-of-the-range satellite navigation system. As you'd rightly expect from a GPS system that costs nearly £300, it comes preloaded with maps covering a huge geographical area. You could start off in Andorra, drive through Liechtenstein, take in Sweden and tour the Czech Republic safe in the knowledge the PNA470 can get you safely back to Pratts Bottom (near Bromley) if the need arises. The PNA470 has the TMC traffic master system that picks up information about jams, so you can avoid bank holiday traffic. When the device detects road congestion, it can be set to navigate around it. The information is broadcast on an FM frequency and, as such, you need another aerial. This isn't uncommon among GPS devices but it's still a pain - the aerial is a long wire and reflects annoyingly in the windscreen. We also found picking up a TMC signal quite difficult. When you're on the road, the Medion's basic features work admirably well. Lesser machines can only search for four, but this allows you to enter all seven characters of a postcode, which increases the precision of your search. The machine's display is clear and there are useful touches like a graphical bar showing the distance to a junction. So far so good. And then it comes to the machine's text-to-speech system. This is a system designed to read out place names as you approach locations key to your journey. In theory, this feature can be a real bonus; TomTom's 910 has the system and it works beautifully, sounding almost human. The PNA470 does less well. Its system sounds purely synthesised and makes a poor job of pronouncing place names: Tow-kes-bury for Tewkesbury and Sow Pit Lane to Saw Pit Lane. Picking on the Medion's pronunciation isn't just an academic criticism. Working out what the machine is trying to say is an unwanted distraction when you're going 70mph on the M5. Despite its poor speech system, the PNA470 is a solid machine. Sadly, though, it's a few quid more than the TomTom 910. With that in mind, the 910 retains our choice recommendation as the best GPS navigation system around.